One of the jars of chunky style kimchi broke. We weren’t home when it happened, so we don’t know if it was an explosion, pop or just broke due to pressure building up. 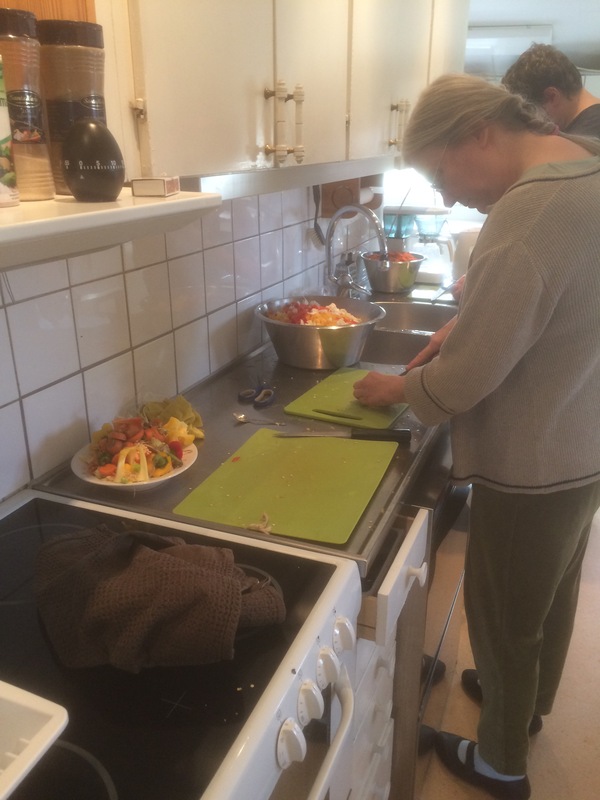 When we got home, the kitchen floor was all wet and there was a bit of a mess to clean up. 4 liters of kimchi gone. It didn’t look like an explosion. It must have been a flaw in the glass jar that broke under pressure. Some people have heard about or maybe experienced explosions and asked me about this problem. I’ve never had an explosion, but two times jars have broken under pressure. My recommendation is to be carefull handling the jars so that they don’t bang or click together. Another thing I heard is to slightly open the lid of the jars to let the pressure gases out and not let air in once a day during the first week. 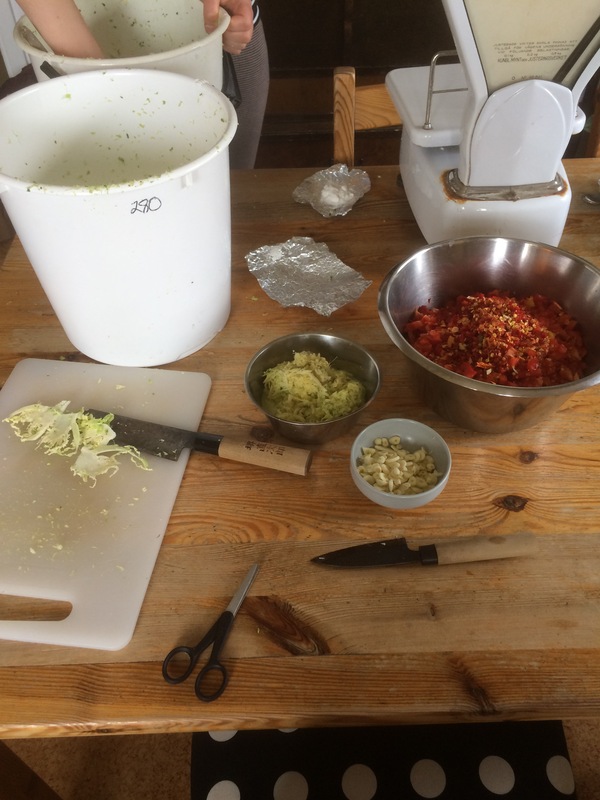 A few weeks ago we made some kimchi where the ingredients were finely shredded and packed like sauerkraut. This time we made it chunky style with coarsely chopped vegetables. 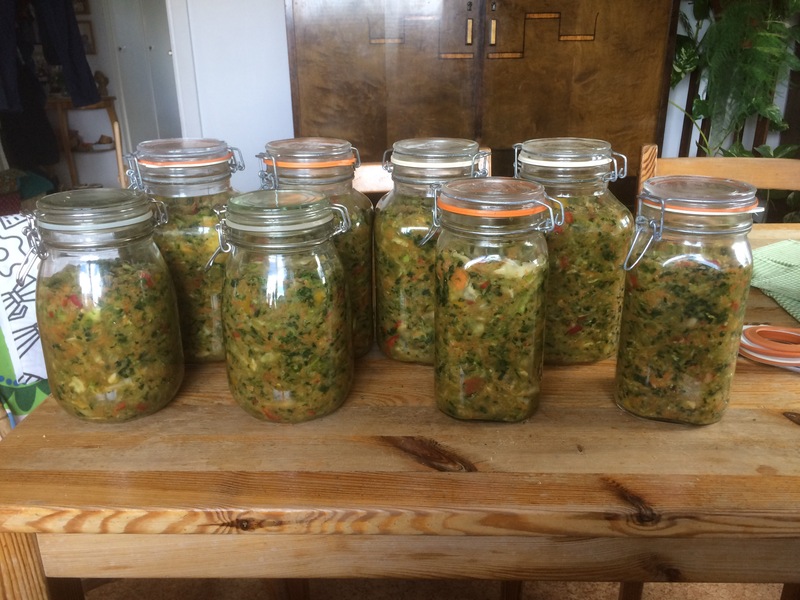 And this time packed into jars (not pounded) and covered with a 3% brine. My version of kimchi! 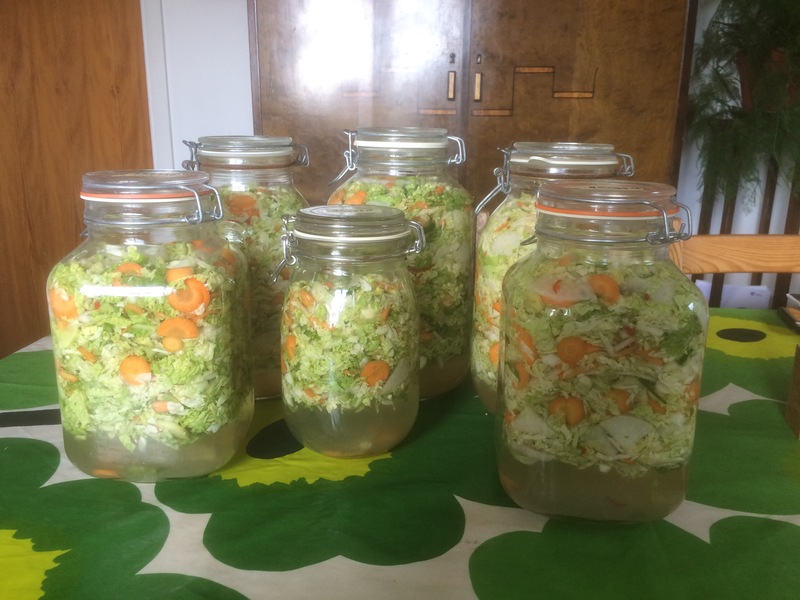 I started to run out of kimchi for sales, so had to make more. My own savoy and asian cabbages are not looking good after this summers drought and onslaught of bugs (they are looking better as the weather cools and it rains). So I had to go to the supermarket and get ingredients to complement my own garlic, carrots, peppers and chilis. 15 grams seasalt per kilo ingredients. 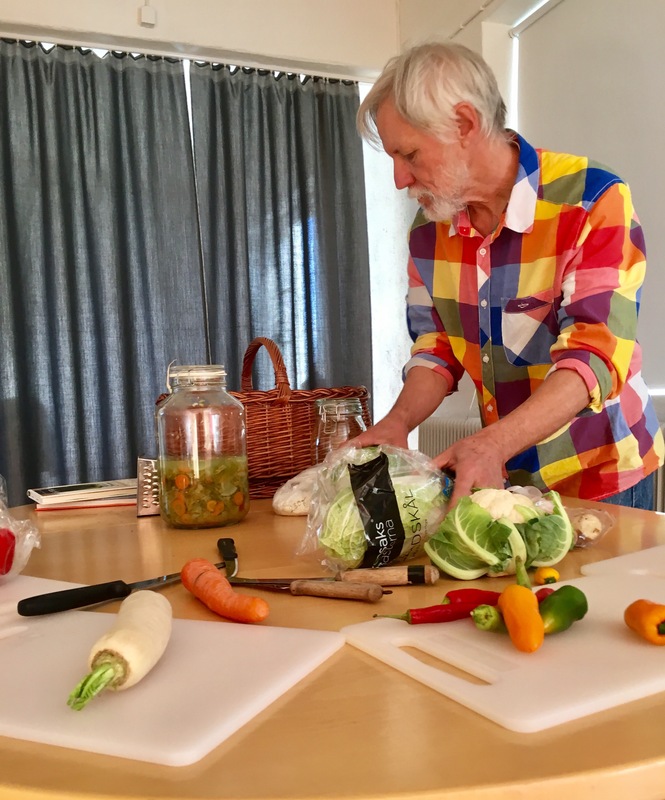 Presto – 15 kilos of vegies becomes 17 liters ready for fermentation. 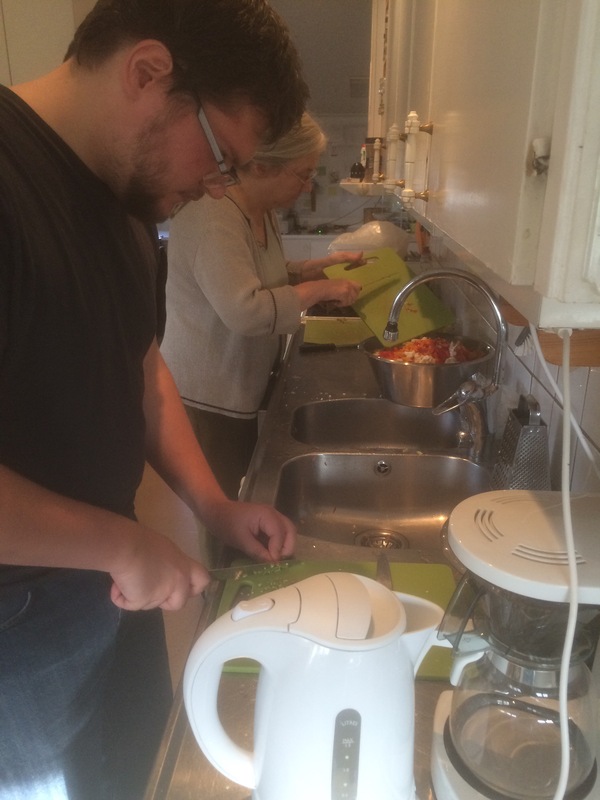 We had a gang over to study kimchi making. The youthful enthusiasin turned it into a great party. 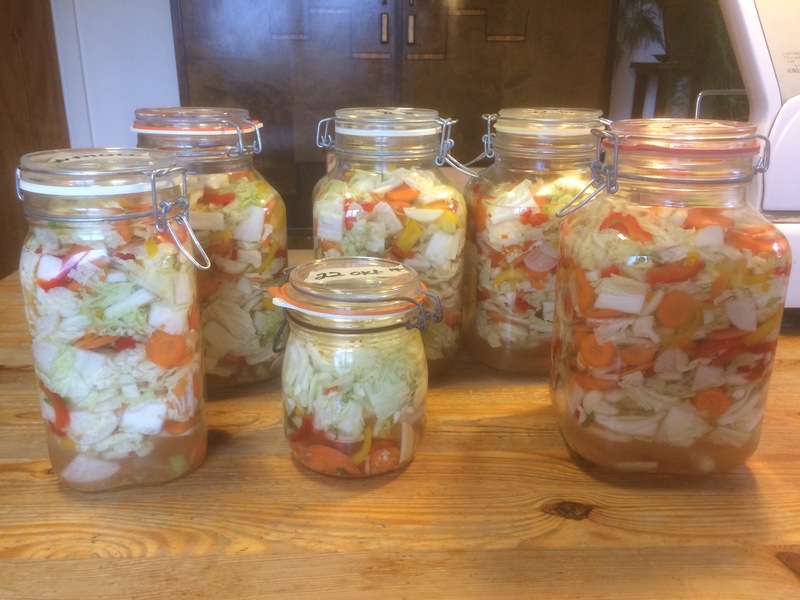 We made 2 kinds of kimchi – sauerkraut style and chunky style, and turned about 25 kilos of vegetables into many jars of kimchi. Lots for everybody to take home. 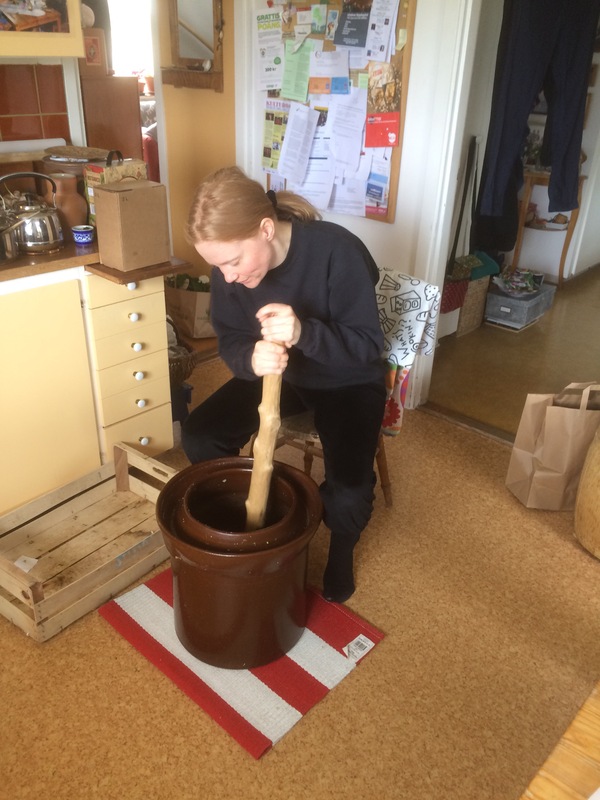 The third fermentation festival took place on saturday as usual in Uddebo. It was the best one ever. 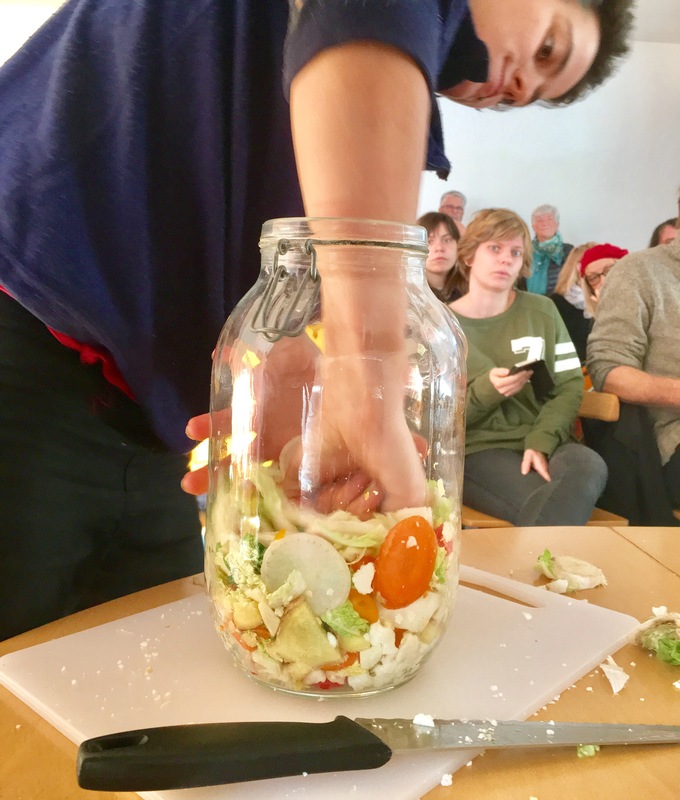 This year I did 2 demonstrations – kimchi and miso. I was so busy I forgot to take some good pictures, only a few lousy ones. 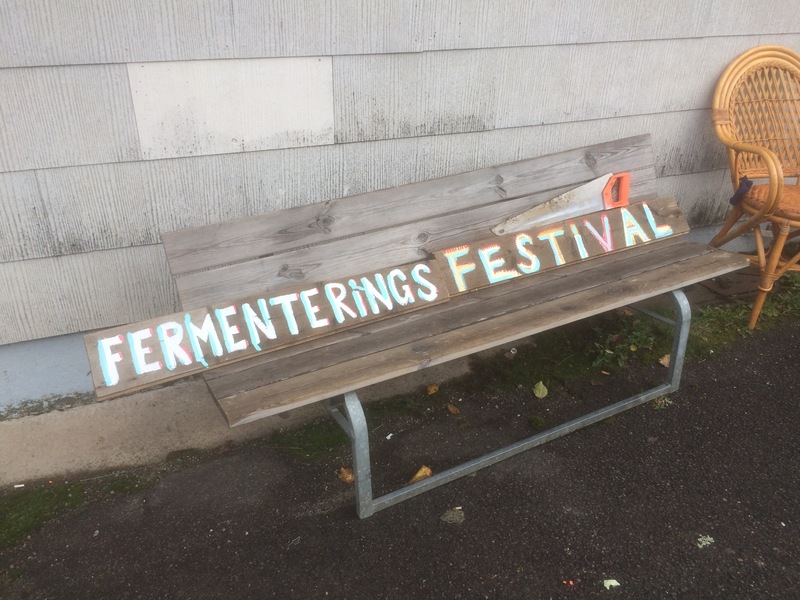 Like this presentation of infamous fermentations. 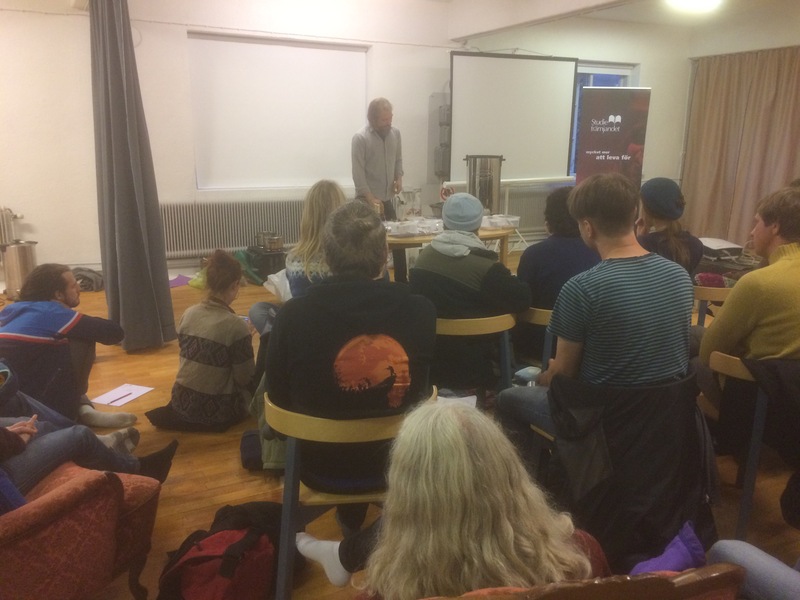 Or this of Edvard Rödseth talking about beer making. 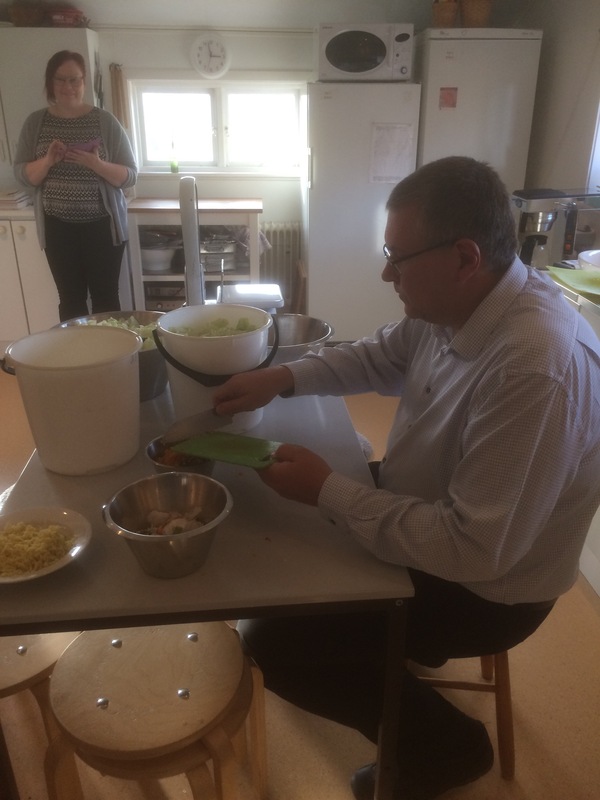 Luckily Emma Persson got some very good pictures of my demonstration on kimchi making. The last day of the course came yesterday. 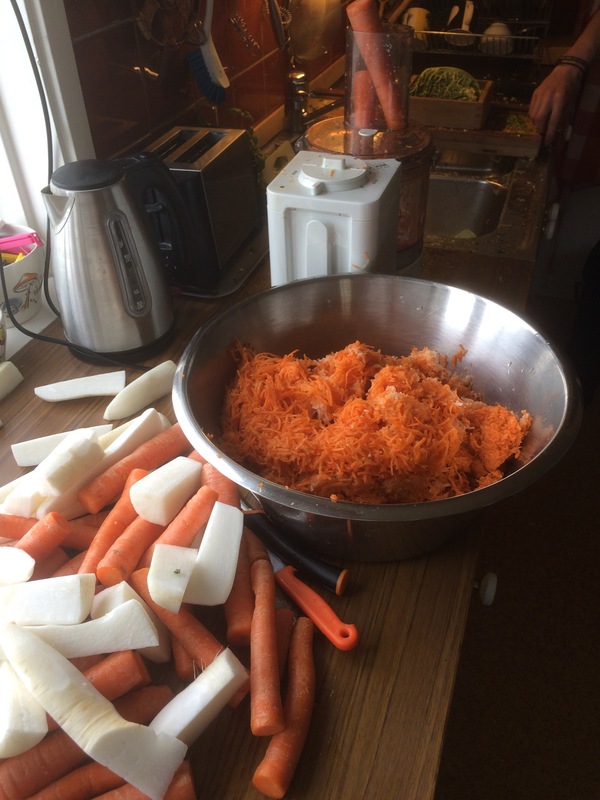 The first session we sauerkraut, the second time we made pickled carrots and this time we made chunky style kimchi. 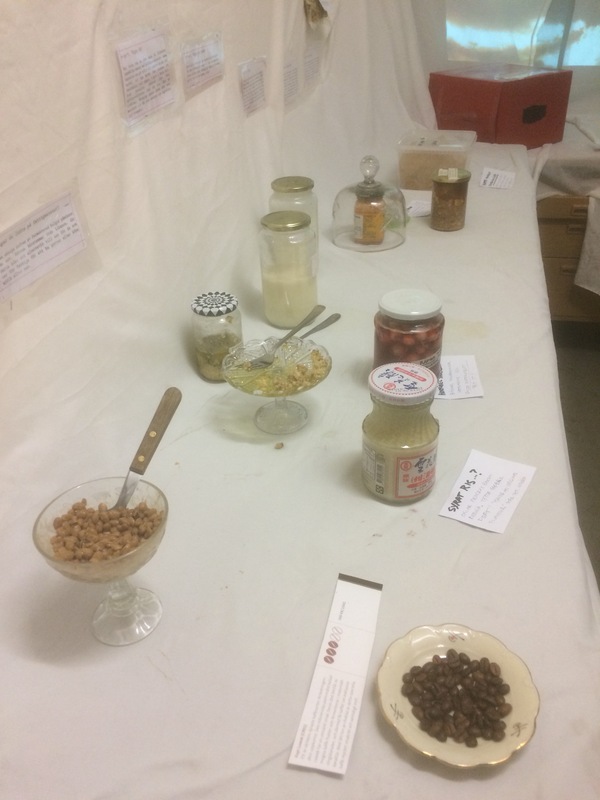 After all the participants filled their jars, there was a lot left for me. 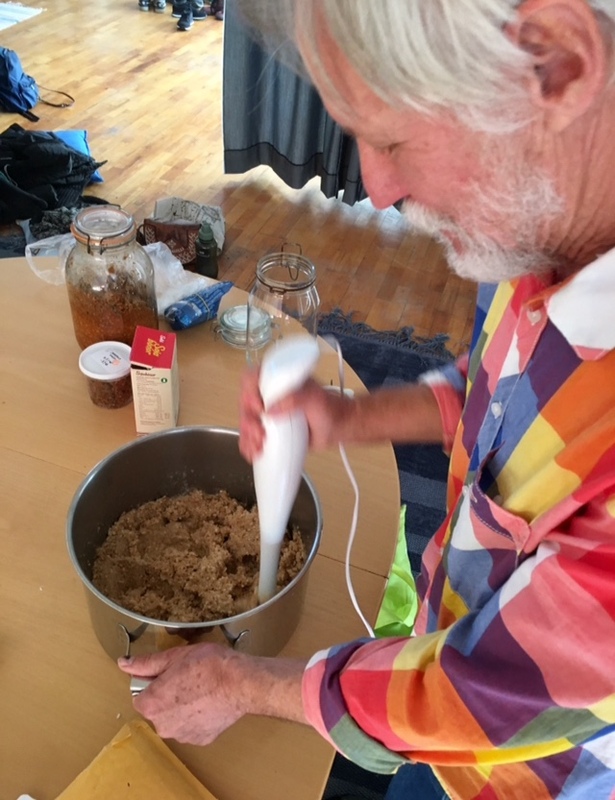 Maybe we can have a follow up course and make some other fermented foods like miso. 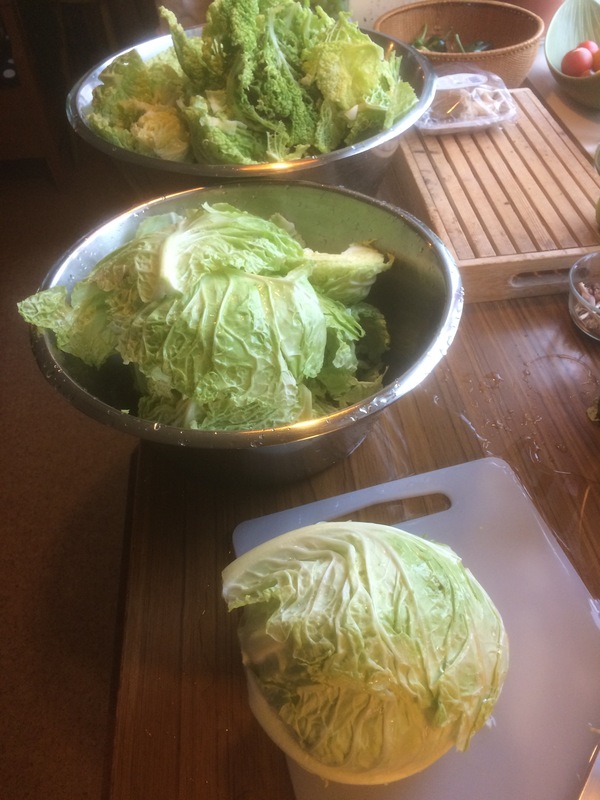 I picked some savoy cabbages to make some kimchi. They looked pretty bad because of all the pests eating away at them. 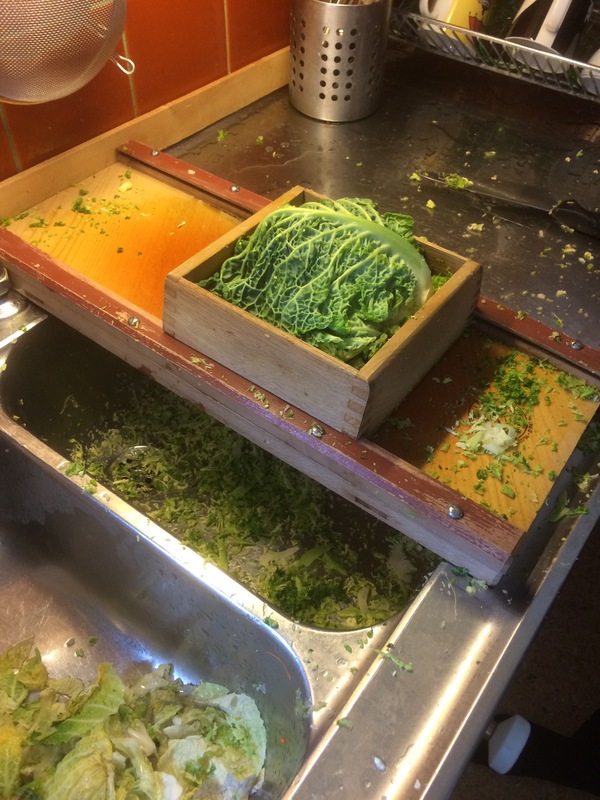 It seamed like there wouldn’t be much kimchi, but after cleaning them, I found a lot that I could use. So along with the other ingredients, I made some. Most of the ingredients were from my garden, but I did have to buy some daikon radish and ginger. And it turned out to be quite a big batch. 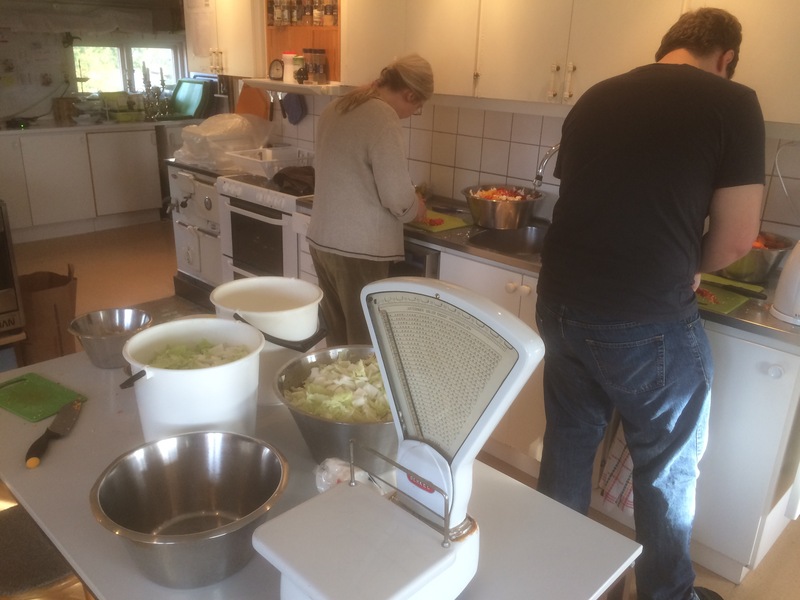 Today we made a new big batch of kimchi based on the age old sauerkraut method. It’s good and my customers really like it. 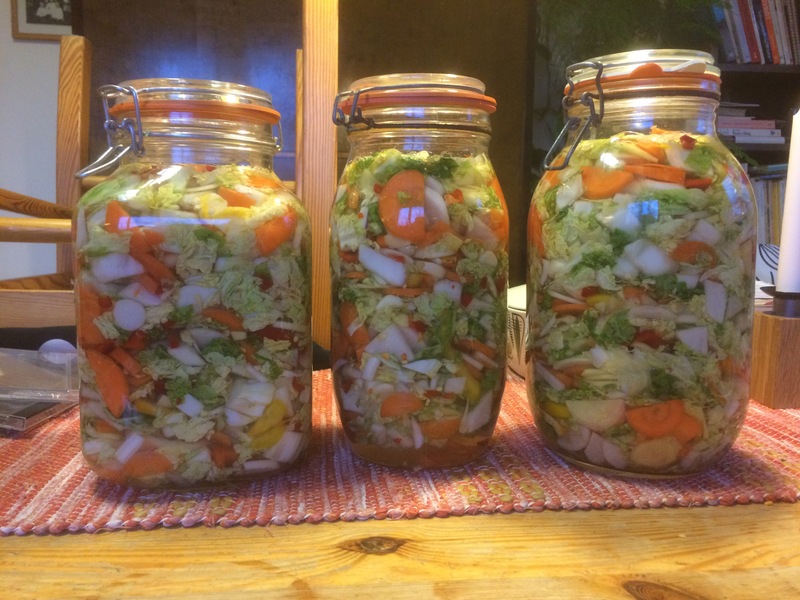 mix everything together and put it all into fermentation jars. I should have been more observant earlier. I’m running out of kimchi for selling at the market. 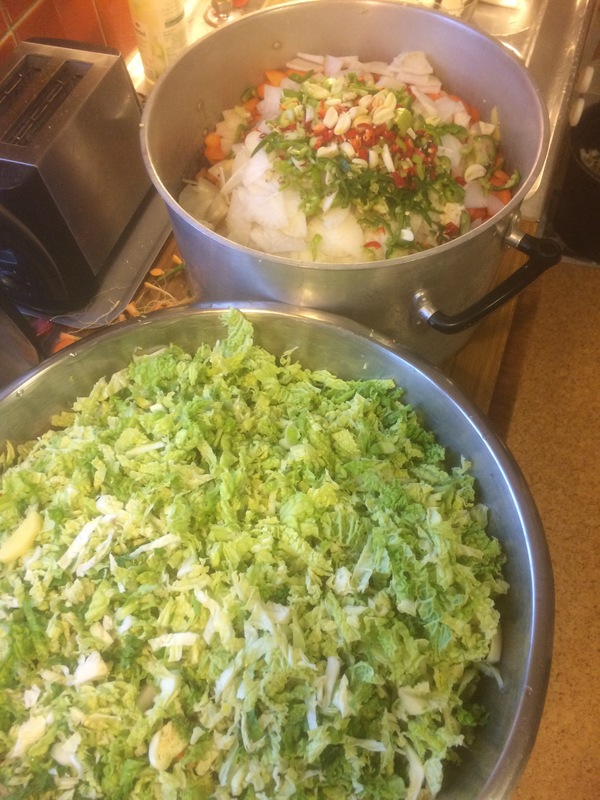 My kimchi has become a main sales item, as well as a favorite at home, so I’d better make lots more at a steady pace. 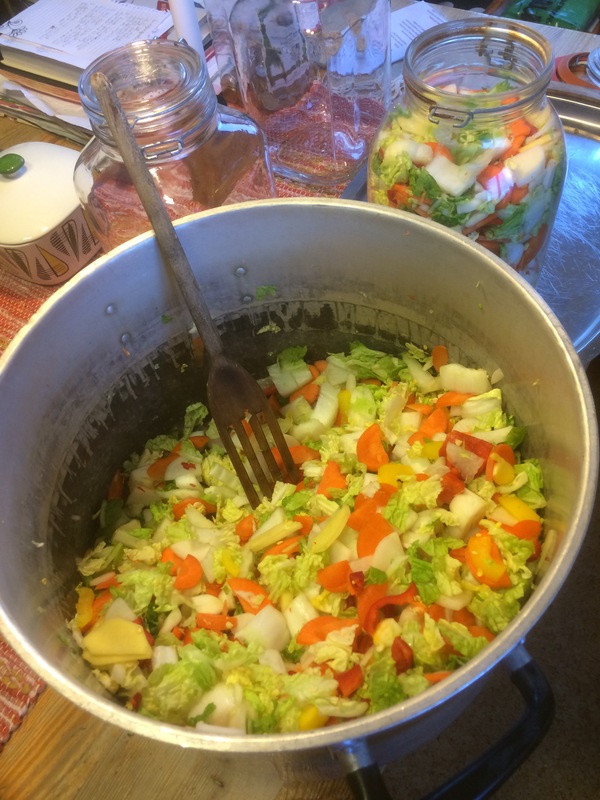 After the market yesterday, I bought some ingredients and made a simple kimchi – chunky style. Start by chopping and mixing everything together. Stuff into fermentation jars and add a 3% salt brine. The hard part is waitng about 4 weeks for a good fermentation.